OAKLAND, Calif.—Their feet sore and voices hoarse after a long day of vigorous picketing, hundreds of striking Kaiser Permanente mental health workers gathered here Dec. 11 to hear, and cheer for, a panel of clinicians, union and political leaders, patients and family members challenging California’s largest healthcare provider over the unequal care mental health patients receive, compared with those experiencing physical illnesses. 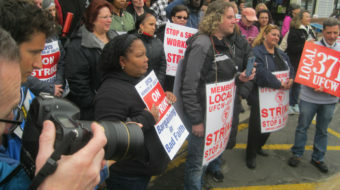 The gathering was one event in an action-packed five-day strike by some 4000 psychologists, therapists, social workers, psychiatric nurses and addiction specialists—members of the National Union of Healthcare Workers—affecting over 100 Kaiser Permanente facilities throughout California. NUHW is demanding that Kaiser make treatment appointments more available, hire more therapists, give them more latitude to exercise clinical judgment about the type and frequency of care, and give therapists the same pay and benefits as other staff members. The workers’ contract expired Sept. 30. 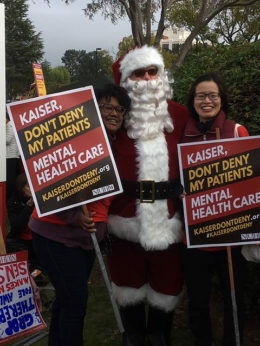 Reflecting the strikers’ main demand—equal treatment for all Kaiser patients whether presenting with mental or physical illness—NUHW President Sal Rosselli called the issue both a challenge and an opportunity. 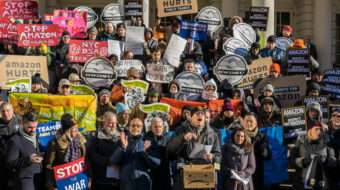 Despite progress in recent years, Rosselli said, “We stand at a critical moment in the struggle for mental health care” as the whole country struggles with rapidly rising diagnoses of major depression and of suicide, together with the opioid epidemic and other addictions. The opportunity, Rosselli said, comes from the ability to make changes to health care across the nation by turning around Kaiser’s persistent pattern of unequal care. Patients and family members on the panel gave heart-wrenching accounts of their experiences. Seong Brown, whose highly gifted daughter, Elizabeth, died by suicide after having to drop out of college, described her family’s quest for adequate treatment at Kaiser. When her daughter said she needed a therapist, Brown said it took nearly two months to get an initial appointment, and the family was finally forced to seek treatment through Kaiser’s list of independent contractors. Elizabeth returned to college, but came home again months later, experiencing suicidal thoughts. After Kaiser delayed and cut short an intensive treatment program recommended by her outside therapist, Elizabeth hanged herself early this year. 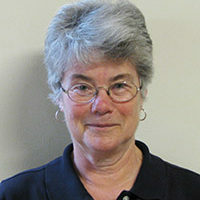 Susan Runyon, a 71-year-old retired vibration therapist and longtime Kaiser member, told of her lifelong struggle with anxiety and depression, and drew the contrast between her earlier and recent experiences seeking mental health care. Runyon ended up paying thousands of dollars for a private therapist. When depression returned in 2014, Kaiser referred her to their list of outside therapists. After 16 calls she finally found one who had an opening the following month. With a constant stream of new patients, she said, clinicians are constantly juggling patients and their needs, which become more difficult all the time. Kaiser therapists are being asked to shorten the time for intensive outpatient treatment, in which teens and family members are seen individually once or twice a week in addition to group therapy, so patients can more quickly be switched to generalists, Ray said. “That would be me, who now has an average of four to six weeks between appointments with patients.” There’s no way these patients will be stable enough to come down to such a schedule or be referred out to a contract therapist. Speaking before the panel presentations, state Senator Jim Beall, D-San Jose, a leader on healthcare issues in the California legislature, told strikers they have full support of his colleagues in the legislature’s Mental Health Caucus and the Senate Select Committee on Mental Health. “Besides improving working conditions for you and your colleagues and improving mental health outcomes for patients around the state, we must assure that mental health services are treated on an equal playing field with physical ailments,” Beall said. “That’s why we have introduced Senate Bill 11, the Mental Health Parity Act” requiring health insurers and state agencies to guarantee full coverage for mental health and substance abuse disorder services. Another bill, SB 12, would establish at least 100 new mental health drop-in centers around the state, to deliver mental health services to youth whether they have insurance or not, Beall said. The afternoon’s final speaker was Patrick Kennedy, former Congressman and leading national advocate for parity of mental health and addiction care with treatment for other medical conditions. 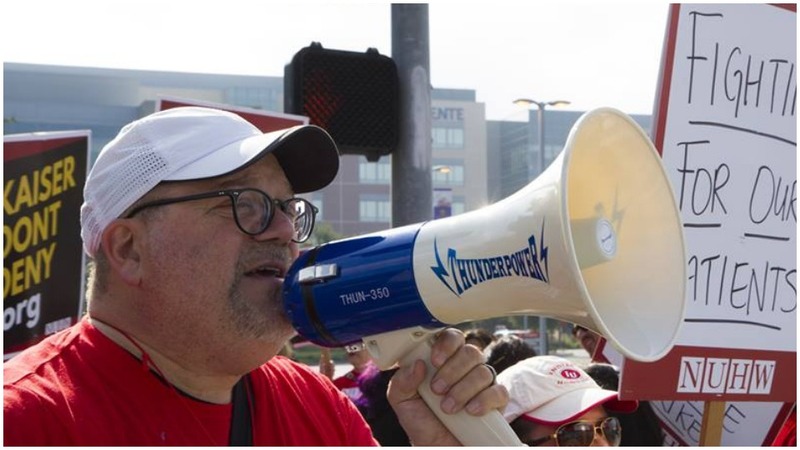 Calling NUHW’s strike “very timely” for the people of California as they seek better and more prompt care, Kennedy emphasized that the problem isn’t just an issue for Kaiser Permanente, but also for a broad range of health insurers. NUHW represents some 14,000 health workers, including service and technical workers, nursing assistants, registered and licensed vocational nurses, mental health clinicians and clerical workers.